One of my older brothers used to read X-Men and X-Factor when I was growing up in the 80s. Regular readers know that I’ve always been a Spider-Man fan, but I think it’s safe to say that I read plenty of stories with Bobby Drake. 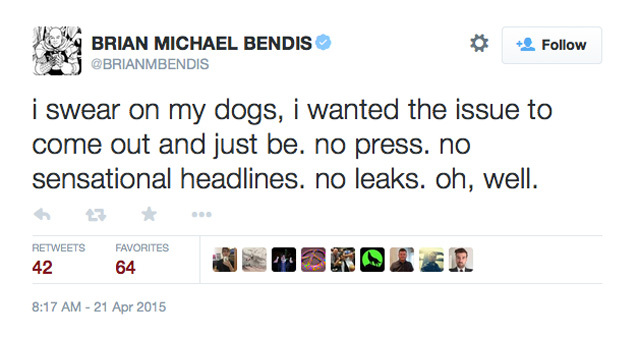 Now, after all these years, Brian Michael Bendis has decided that the character is gay. Why? Answer: Diversity! 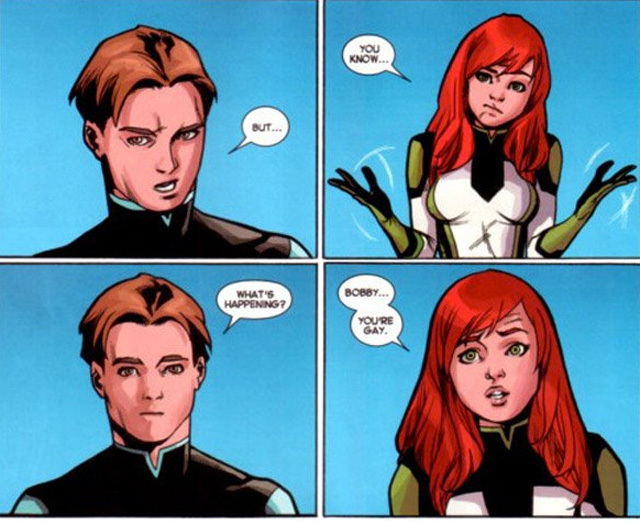 Bobby Drake, otherwise known as classic X-Men member Iceman, will come out of the closet this week. In a collection of leaked panels from All-New X-Men #40, due out tomorrow, Drake finds himself outed by fellow teammate Jean Grey. The revelation makes Iceman one of the most prominent (and powerful) LGBT superheroes in Marvel comics, and is in keeping with the company’s push for more diversity among its characters. The circumstances surrounding the character’s coming out are unique, to say the least. Readers discover that the past, teenaged Bobby Drake, who has been transported to the future along with the original X-Men to help solve a crisis, is gay. Meanwhile, the present-day Iceman — who is still very much around — has had relationships with multiple women in the past. Apparently, that was an act. A writer who thinks that a character with a long history of dating women can convincingly be turned gay over night is almost as embarrassing as the writer who tells a long and involved tale that ends “…and then I woke up!” Only a company with zero respect for its audience would allow such lazy and transparent pandering to happen. Marvel expects its fans to clap like trained diversity seals who care more about politically correct editorial mandates than sound storytelling. Given that comic industry journalists are little more than Marvel and DC propaganda arms, it’s a good bet you will soon hear the sound of happy seals. If Marvel created a brand new hero who just so happened to be gay — or perhaps a gay, disabled, black and Muslim super-powered diversity-mutant — then that could have happened. No one really cares about introducing new characters, but they do care about arbitrarily making drastic changes to a character they’ve known for decades. They also care when legitimate criticism runs up against men like Dan you-support-Jim-Crow-laws-if-you-think-Peter-Parker-should-stay-white Slott. Read through the comments section on the websites reporting on the suddenly-gay Bobby Drake, and you’ll see plenty of the “you just have a thing against gay people” mentality on display. It’s sad and pathetic, but it’s the kind of stupid partisanship Marvel needs in spades if it plans to continue these stunts. After years and years of evidence to the contrary, readers are now supposed to believe that the way to melt Iceman’s heart is to have a Y chromosome. If you’re not a fan of Marvel’s diversity for the sake of diversity business model, then I suggest walking away from the brand and letting them know on your regular circuit of comic-related news sites. Only when it bleeds enough in sales will the company possibly get the message. Hat Tip: douglasernstblog.com reader Eidolon.